This is the fifth in a seven part series highlighting Milo’s remaining living grandchildren. These profiles were written in 2006. I am Rosetta Fern Andrus Woolf Gibb (Maragaret Ann Boyce), the fifth daughter of Benjamin Boyce Andrus and Lydia Rosetta French. I was born on December 10, 1918. Imagine dad and mom’s disappointment when they so wanted a son, to get a big gawky awkward daughter—daughter No. 5. But they loved me anyway. My only brother, Milo, was born two years later, followed by three more girls. Mom and dad were always proud of their daughters and said they could all work like boys. Our family consisted of dad, mom, Grace, Nellie, Jacquetta, Gwen, Fern, Milo, Phyllis, Alice, and Beth. I was born in Hill Spring, Alberta, Canada, and lived there for 80 years. I goy my schooling in Hill Spring up through grade 11 as that was all they had at the time. I always had to work and learned the value of work at a young age. Milking cows, feeding pigs, hoeing gardens, wrangling horses, stocking grain, picking berries, and topping beets was a way of life for me. 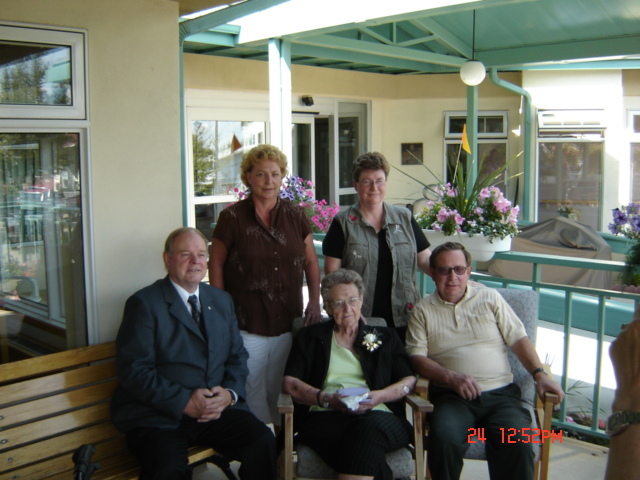 This is the fourth in a seven part series highlighting Milo’s remaining living grandchildren. These profiles were written in 2006. I, Gwennie May Andrus Barfus (Margaret Ann Boyce), was born to Benjamin Boyce Andrus and Lydia Rosetta French on August 24, 1916, in Hill Spring, Alberta, Canada. I had seven sisters, Grace, Nellie, Jacquetta, Fern, Phyllis, Alice and Beth, and one brother, Benjamin Milo, who was killed during WWII. My dad had a farm southeast of Hill Spring. It was here that I learned what a hard days stooking as was as well as milking cows, feeding pigs, and driving six head of horses attached to a plow. I spent many hours working the fields with my dad. We were a very close family; we had to be as there was not room not to be close. Our home was very tiny in today’s standards. All my activities centered around church, school, and family. I had good teachers both at school and church and I liked to go to both. I want to emphasize that my childhood and my growing-up years were fun and full of all good things. I was in theatre productions, participated in basketball, softball, and hockey. This is the third in a seven part series highlighting Milo’s remaining living grandchildren. These profiles were written in 2006. A cold winter day, January 24, 1919 in Elba, Cassia, Idaho, Ted was born to Hyrum Andrus (son of Milo Andrus and Margaret Ann Boyce) and Virginia (Jenny) Garner Andrus. They lived in a two-story frame house and it was very nice. The home was located on 80 acres where they raised grain and were surrounded by beautiful mountains, crystal clear mountain streams and a close-knit community. He was born into a family of one older sister, Margaret and four older brothers, Charles, William, (Brother Bill), Owen and George. Ted was the youngest. Ted describes his father Hyrum as “the best of four-team drivers.” He hauled freight to the end of the railroad in Utah to the Alma Elba stores. He also would build the grades to make roads in these areas and in Yellowstone Park and throughout the West. His group prepared the bare ground, filled the gullies, etc. so they could make a road. He could stack hay faster than younger men. This is the second in a seven part series highlighting Milo’s remaining living grandchildren. These profiles were written in 2006. My name is Beth Andrus Cahoon (Margaret Ann Boyce). I was born in Cardston, Alberta, Canada, the ninth child of Benjamin Boyce Andrus and Lydia Rosetta French. I was welcomed into their large family on a cold morning of December 2, 1930. My appearance must have been a total shock as the Andrus clan had finished their family (they thought) six years earlier. I was, however, a delightful child and soon won their hearts—I’m told. My childhood was happy and carefree as I roamed the hills of Hill Spring, rode our old horse “Babe,” swam in the canal in summer and skated on one of the three ponds around our little hamlet in the winter. The foothills west of Spring Hill were crowded with sleighs and toboggans every Saturday during the winter months. “The Lone Ranger” galloped into our home on the airways of our old Marconi radio at 5:00 p.m. every week night. We were glued to the old set to witness his wonderful adventures. Every Monday night we welcomed glamour into our huge kitchen as we settled as a family for the Lux Theatre. There was always a great show, and the star of the production always talked personally to each of us as she told us of her perfect complexion obtained from using Lux Toilet Soap. This is the first in a seven part series highlighting Milo’s remaining living grandchildren. These profiles were written in 2006. Watch for the other profiles in upcoming weeks. My name is Phyllis Edrie Andrus Walburger (Margaret Ann Boyce). I was born July 8, 1922, to wonderful parents, Benjamin Boyce Andrus and Lydia Rosetta French. I was the seventh child and the sixth daughter born, to take my place in this great family. My dad and mother, five sisters and my brother, Milo, who was just two years older than I, were very special to me and I loved them all so dearly. Then after two years, I got to have two more sisters, which brought a lot more fun and loving into my life. I was baptized July 8, 1930, on my eighth birthday. Now, I was truly a member of the Church of Jesus Christ of Latter-day Saints, and I have always been proud of this and have tried to be obedient and faithful to my Heavenly Father and he has granted me so many blessings. I thank Him for these blessings every day of my life. Tom Andrus is a descendant of Milo Andrus. Tom and Anne Andrus always hoped to take their kids on an adventurous family voyage. Now, they’ve made their dream a reality with a 365-day expedition around the world! Anne, Tom and their four kids—14-year-old Dax, 12-year-old McKane, 7-year-old Kieran and 4-year-old Asher—left their Atlanta home and hit the road on August 27, 2006. First stop, New Zealand! About eight months into their trip, they have already had their fair share of adventure touring floating villages in Vietnam, dancing on Namibian sand dunes, tubing down a river in Laos, visiting museums in France and even meeting an elephant in Botswana…and they still have five months to go. They appeared on The Oprah Show on April 2, 2007 via satellite from the summit of a mountain in Cape Town, South Africa. To see photos and learn more about the family and their trip, visit their blog www.sixintheworld.com. Where Did You Serve Your Mission? In his lifetime Milo served eight missions for the LDS Church. He served in Ohio (four times), New York, England (twice), and in the Eastern states. If you are a descendant of Milo, and served an LDS mission, where did you serve? Ever wonder where the descendants of Milo have spread out to? Answer our poll and see. Grant Merrill Andrus, who goes by the name of Merrill, was born on 15 July 1925 in Ucon, Bonneville County, Idaho, the son of Grant Munday Andrus, who went by the name of Grant, and May Walker Andrus. Grant, born and raised in Ucon, Idaho, is the son of Robert Andrus and Lovenia Bawden Andrus. Robert is the son of Milo Andrus and Jane Munday Andrus. This page is where you can find out a little more about your family members. Write a brief profile or history of yourself and we will post it here. Tell us about your hobbies, favorite books, websites, music, and contact information if you like. You can also include pictures. In the future we will also highlight members of the family and tell about their special achievements (oldest living members, etc.). Click here to submit your profile or history.